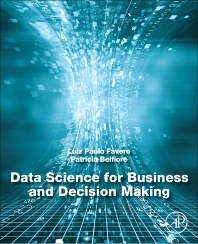 Data Science for Business and Decision Making covers both statistics and operations research while most competing textbooks focus on one or the other. As a result, the book more clearly defines the principles of business analytics for those who want to apply quantitative methods in their work. Its emphasis reflects the importance of regression, optimization and simulation for practitioners of business analytics. Each chapter uses a didactic format that is followed by exercises and answers. Freely-accessible datasets enable students and professionals to work with Excel, Stata Statistical Software®, and IBM SPSS Statistics Software®. LUIZ PAULO FAVERO is a Full Professor at the Economics, Business Administration and Accounting College of the University of Sao Paulo (FEA/USP), where he teaches Data Analysis, Multivariate Modelling and Operational Research to undergraduate, Master’s and Doctorate students. He has a Post-Doctorate degree in Financial Econometrics from Columbia University in New York. He is a tenured Professor by FEA/USP (with greater focus on Quantitative Modelling). He has a degree in Civil Engineering from USP Polytechnic School, a post-graduate degree in Business Administration from Getulio Vargas Foundation (FGV/SP), and he has received the titles of Master and PhD in Business Administration (with greater focus on Organizational Economics) from FEA/USP. Mr. Favero has also taken part in Econometrics Modelling courses at California State University and at Universidad de Salamanca, and Case Studies courses at Harvard Business School. He is a Visiting Professor at the Federal University of Sao Paulo (UNIFESP) and a Professor of graduate courses (specializations and MBAs) at FIA and FIPE. He is the author of the following books Data Analysis Manual: Statistics and Multivariate Modelling with Excel®, SPSS® and Stata®, Data Analysis: Regression Models with Excel®, Stata® and SPSS®, Data Analysis: Multivariate Exploratory Techniques with SPSS® and Stata®, Quantitative Methods with Stata®, Data Analysis: Multivariate Modelling for Decision Making, Operational Research for Engineering courses and Operational Research for Business Administration, Accounting and Economics courses, all of them published by Elsevier. He also coauthored Contemporary Studies in Economics and Financial Analysis and Trends in International Trade Issues. He is the editor-in-chief of the International Journal of Multivariate Data Analysis. He is the author of articles published in several national and international conferences and in scientific journals, including the Journal of Applied Econometrics, Central European Journal of Operations Research, International Journal of Bank Marketing, Finance Research Letters, Journal of Behavioral Finance, Emerging Markets Finance and Trade, Revista Latinoamericana de Administración, Revista Brasileira de Estatística, among others. He is a managing-partner at Montvero Consulting and Training and a consultant to companies in the fields of Data Science, Business Analytics and Business Intelligence, with the use of Machine Learning, Big Data and Data Analysis for Decision Making tools, such as, Python, R, SAS, Stata and IBM SPSS. LUIZ PAULO FÁVERO é professor titular da Faculdade de Economia, Administração e Contabilidade da Universidade de São Paulo (FEA/USP), onde leciona disciplinas de Análise de Dados, Modelagem Multivariada e Pesquisa Operacional em cursos de graduação, mestrado e doutorado. Tem Pós-Doutorado em Econometria Financeira pela Columbia University em Nova York. É livre-docente pela FEA/USP (ênfase em Modelagem Quantitativa). É graduado em Engenharia Civil pela Escola Politécnica da USP, pós-graduado em Administração pela Fundação Getulio Vargas (FGV/SP) e obteve os títulos de mestre e doutor em Administração (ênfase em Economia das Organizações) pela FEA/USP. Participou de cursos de Modelagem Econométrica na California State University e na Universidad de Salamanca, e de Cases Studies na Harvard Business School. É professor visitante da Universidade Federal de São Paulo (UNIFESP) e professor em cursos de pós-graduação (especialização e MBA) da FIA e da FIPE. É autor dos livros Manual de Análise de Dados: Estatística e Modelagem Multivariada com Excel®, SPSS® e Stata®, Análise de Dados: Modelos de Regressão com Excel®, Stata® e SPSS®, Análise de Dados: Técnicas Multivariadas Exploratórias com SPSS® e Stata®, Métodos Quantitativos com Stata®, Análise de Dados: Modelagem Multivariada para Tomada de Decisões, Pesquisa Operacional para cursos de Engenharia e Pesquisa Operacional para cursos de Administração, Contabilidade e Economia, todos publicados pela Elsevier. É também coautor de Contemporary Studies in Economics and Financial Analysis e Trends in International Trade Issues. É editor-chefe do International Journal of Multivariate Data Analysis. É autor de artigos publicados em diversos congressos nacionais e internacionais e em periódicos científicos, incluindo Journal of Applied Econometrics, Central European Journal of Operations Research, International Journal of Bank Marketing, Finance Research Letters, Journal of Behavioral Finance, Emerging Markets Finance and Trade, Revista Latinoamericana de Administración, Revista Brasileira de Estatística, entre outros. É sócio-diretor da Montvero Consultoria e Treinamento e consultor de empresas nas áreas de Data Science, Business Analytics e Business Intelligence, com uso de ferramentas de Machine Learning, Big Data e Análise de Dados para Tomada de Decisão, como Python, R, SAS, Stata e IBM SPSS. PATRICIA BELFIORE is a Professor at the Federal University of ABC (UFABC), where she teaches Statistics, Operational Research, Production Planning and Control, and Logistics to Management Engineering students. She is a Master in Electrical Engineering and a PhD in Production Engineering from the Polytechnic School of the University of Sao Paulo (EPUSP). She has a Post-Doctorate degree in Operational Research and Logistics from Columbia University in New York. She takes part in several research and consultancy projects in the fields of modelling, optimization and logistics. She has taught Operational Research, Multivariate Data Analysis and Operations Management and Logistics to undergraduate and Master’s students at FEI University Center and at the Arts, Sciences and Humanities College of the University of Sao Paulo (EACH/USP). Her main research interests are in the fields of modelling, combinatorial optimization and heuristics for decision making. She is the author of the following books Data Analysis Manual: Statistics and Multivariate Modelling with Excel®, SPSS® and Stata®, Statistics Applied to Business Administration, Accounting and Economics with Excel® and SPSS®, Data Analysis: Multivariate Exploratory Techniques with SPSS® and Stata®, Quantitative Methods with Stata®, Data Analysis: Multivariate Modelling for Decision Making, Operational Research for Engineering courses and Operational Research for Business Administration, Accounting and Economics courses, all of them published by Elsevier. She is the author of articles published in several national and international conferences and in scientific journals, including the European Journal of Operational Research, Computers & Industrial Engineering, Central European Journal of Operations Research, International Journal of Management, Production, Management & Production, Transportation, Economic Studies, among others. She is a managing-partner at Montvero Consulting and Training and a consultant to companies in the fields of Data Science, Business Analytics and Artificial Intelligence, and Process Simulation and Optimization, with the use of Machine Learning, Data Analysis and Operational Research tools, such as, R, Stata, IBM SPSS and ProModel. PATRÍCIA BELFIORE é professora da Universidade Federal do ABC (UFABC), onde leciona disciplinas de Estatística, Pesquisa Operacional, Planejamento e Controle de Produção e Logística para o curso de Engenharia de Gestão. É mestre em Engenharia Elétrica e doutora em Engenharia de Produção pela Escola Politécnica da Universidade de São Paulo (EPUSP). Possui Pós-Doutorado em Pesquisa Operacional e Logística pela Columbia University em Nova York. Participa de diversos projetos de pesquisa e consultoria nas áreas de modelagem, otimização e logística. Lecionou disciplinas de Pesquisa Operacional, Análise Multivariada de Dados e Gestão de Operações e Logística em cursos de graduação e mestrado no Centro Universitário da FEI e na Escola de Artes, Ciências e Humanidades da Universidade de São Paulo (EACH/USP). Seus principais interesses de pesquisa situam-se na área de modelagem, otimização combinatória e heurísticas para tomada de decisões. É autora dos livros Manual de Análise de Dados: Estatística e Modelagem Multivariada com Excel®, SPSS® e Stata®, Estatística Aplicada a Administração, Contabilidade e Economia com Excel® e SPSS®, Análise de Dados: Técnicas Multivariadas Exploratórias com SPSS® e Stata®, Métodos Quantitativos com Stata®, Análise de Dados: Modelagem Multivariada para Tomada de Decisões, Pesquisa Operacional para cursos de Engenharia e Pesquisa Operacional para cursos de Administração, Contabilidade e Economia, todos publicados pela Elsevier. É autora de artigos publicados em diversos congressos nacionais e internacionais e em periódicos científicos, incluindo European Journal of Operational Research, Computers & Industrial Engineering, Central European Journal of Operations Research, International Journal of Management, Produção, Gestão & Produção, Transportes, Estudos Econômicos, entre outros. É sócia-diretora da Montvero Consultoria e Treinamento e consultora de empresas nas áreas de Data Science, Business Analytics, Inteligência Artificial, e Simulação e Otimização de Processos, com uso de ferramentas de Machine Learning, Análise de Dados e Pesquisa Operacional, como R, Stata, IBM SPSS e ProModel. Great authors! Very useful content! Impressive didactic! I recommend this book as part of your analytical library. Great TOC! Looking forward to it! Fantastic TOC! I will buy this book. Description and Table of Contents are fanstastic. Looking forward to this book! I was recently informed about the launch of this book and I am sure it will be a very useful work. I will use it in my disciplines! Thanks! I met Professor Favero a few years ago at Columbia University. I'm sure it will be an excellent book. This may be a great book with great topics! I'm looking forward to it!